Southern Mapping is a world leader in providing topographic surveying and mapping for the mining sector. Its team of highly skilled surveying and geographical information system (GIS) staff offer services to support mineral exploration, mine management, planning and rehabilitation. The company combines aerial LiDAR and hyperspectral technologies to produce highly accurate surveys and maps. It is a priority for the company to extend its knowledge and technical expertise into Africa and support the growth of infrastructure development throughout the continent. A sample of our clients includes BHP Billiton, Vale, Angelo America, De Beers and Exxaro. Hyperspectral remote sensing, a result of the integration of optical remote sensing and traditional spectroscopic technologies, allows for the differentiation of unique spectral signatures of targets on the surface of the earth. Hyperspectral systems now make it possible to collect and analyse hundreds of spectral bands across the electromagnetic spectrum, providing detailed spectral data previously not possible through multi-spectral systems. 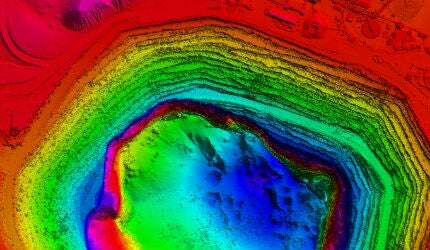 The huge volumes of multi-dimensional data collected by hyperspectral systems make a wide diversity of mining applications possible. Southern Mapping can assist mine management in detecting mineral deposits, indentifying and monitoring mining operations, as well as providing an accurate assessment of the extent of how tailings (dumps) have changed over time, which is necessary in calculating the lifecycle of a mine. Mine pollution supervision is a primary objective at mines. Hyperspectral imagery allows the mining industry and environmental managers to obtain spatially comprehensive and accurate data for mapping and monitoring effects that the mine has on the environment, which assists in ensuring that rehabilitation measures are adhered to. Mining Indaba 2013 has come and gone - and what an Indaba it turned out to be! This year's Mining Indaba was the largest ever, with over 7,700 participants from all over the world. The continued growth of the event is testament to the unrivalled opportunities in African Mining. Southern Mapping Company Pty Ltd, or SMC, was formed on 1 December 2006 with the aim of providing aerial LiDAR surveys to clients worldwide. SMC formed a watershed in the history of survey in Africa as it became the first independtly owned LiDAR company based on the continent. Early in 2012, Southern Mappings' Operations Division moved out to Grand Central Airport - how time flies! It has now been a full year since the relocation and for the past 12 months we have been operating on our own Air Service Licence issued by the South African Civil Aviation Authority. The positive, changing face of the African continent is continuing to attract the lion's share of global exploration dollars as prospectors zoom in on its untold mineral riches.